TOKYO -- A giant bluefin tuna fetched a record 32.49 million yen, or nearly $396,000, in the first auction of the year at the world's largest wholesale fish market in Japan. The price for the 754-pound (342-kilogram) tuna beat the previous record set in 2001 when a 445-pound (202-kilogram) fish sold for 20.2 million yen at Tokyo's Tsukiji market. Wednesday's record-setting tuna was caught off Japan's northern island of Hokkaido. In the last year, there have been several moves to ban or limit catches of tuna, with environmentalists warning that stocks of some species are already close to levels that would render the fish unable to reproduce sufficiently to survive. Conservationists failed at last year's Convention of the International Trade in Endangered Species of Wild Fauna and Flora to impose a ban on the international trade in Atlantic bluefin tuna to preserve breeding stock, due primarily to vigorous lobbying by the Japanese government. The International Union for Conservation of Nature, however, has listed Southern and Atlantic bluefin tuna as endangered species. [B]esides that fact even if everyone stopped using or selling fish in the world, I think that the Japanese -- and I do love Japanese cuisine and adore Japanese food culture -- I think that they're going to plow through the entire world's fishing. They're going to eat everything anyways. So it's a bit of a dilemma. 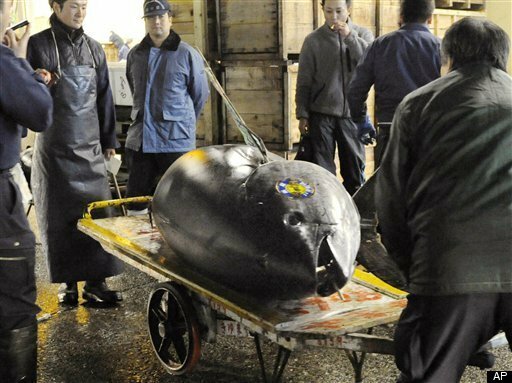 "Giant Bluefin tuna sold at Tokyo auction for near $400,000. Seems cheap at the price, which is extinction." The only reason any bidder at the Tokyo auction ever pays that much for a fish is to deliberately spend way more than any sane person should. Blowing that much on a tuna is either a celebration of recent profits, or a bid for publicity to boost a restaurant or distributor's profile. In short, it's money spent on advertising, not on fish.